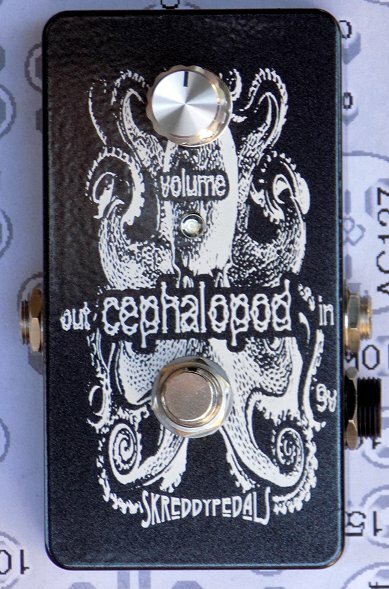 The Skreddy Pedals™ Cephalopod is an aggressive octave-up germanium fuzz that tracks notes very well. Dig in and let it fly! Best pure octave results are achieved using your neck pickup and playing up around the 12th fret region, but you might enjoy using it on chords and riffs with your bridge pickup, too. No special power requirements, just regular negative ground 9v. discontinued; look for a new version soon. Not temperamental or clangy, just pure octave-up driven by a hot, sustaining germanium fuzz. Super easy learning curve; clean up your picking technique a little bit, and you're in business. Features a silicon impedance-matching input stage which makes it play nice anywhere in your signal chain and lets the germanium fuzz sing regardless of buffers, etc. When you turn your guitar volume way down low, you can get that certain grungy cross-over distortion you hear when you keep playing your guitar after turning your amp off, just before the sound fades to silence. It's a cool tone, and you can make it last as long as you like now, without turning off your amp! 9v battery is not included. If you use a battery, then remember to un-plug the input cable from the pedal’s input jack when not in use to prevent draining (or you can also just plug in a power-supply, which disconnects the battery). You may supply external power through an AC adapter. All Skreddy Pedals accept the industry-standard 9v DC plug (5.5mm barrel x 2.1mm center coax), negative tip. Please use a quality, regulated, filtered power supply.